Branch Office for Shriram Transport Finance Co. Ltd. at Bilaspur – Himachal Pradesh – India. Happy Islamic New Year !! Branch Office for Shriram Transport Finance Co. Ltd. at Chandigarh – India. Branch Office for Shriram Transport Finance Co. Ltd. at Ludhiana – Punjab – India. Wishing you and your family a very Happy & Prosperous Diwali !! May this festival of light brings Joy and happiness in your Life !! 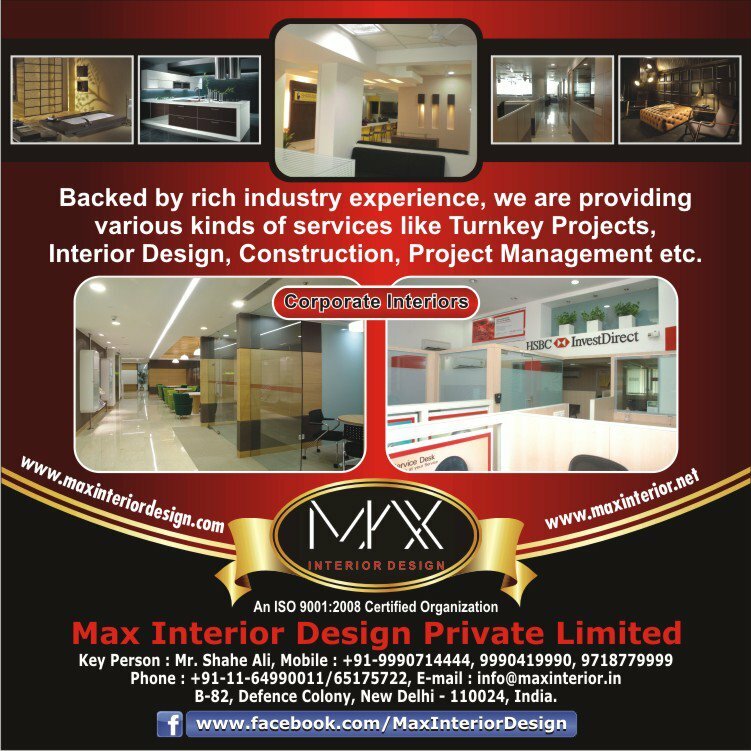 Team - Max Interior Design (P) Ltd. Branch Office for Shriram Transport Finance Co. Ltd. at Jammu – J&K – India. Dear Friends, we are participating in Delhi Build 2011. India Build, re-christened as Delhi Build to facilitate identification and mutual strengthening with ITE Group Plc’s flagship event MosBuild, held in Moscow, Russia, every year. MosBuild is one of the largest exhibition in building materials & construction industry which features more than 2200 exhibitors from 44 countries & has 17 different industry exhibitions under its umbrella. Delhi Build is a showcase for the latest products and services that the construction, building and interiors industry has to offer, from core components to new technologies and exclusive décor and fittings. The show is a great opportunity for domestic and international buyers and suppliers to meet in one place. India’s building and construction industry contributes to almost 15% of the country’s GDP and has been growing at a steady rate of over 10% in the last five years. Due to the high focus on infrastructure development, the country is currently undergoing a major boost to the construction sector, presenting huge investment opportunities to international companies. Delhi Build 2011 is co-located with Panelexpo, the 5th International India Exhibition for wood, bamboo, panels, laminates and allied industries, as well as Illuminex, the 3rd international India lighting exhibition and DelhiInteriors, a specialized international exhibition that covers an entire spectrum of products and services within the interiors industry . The co-location of the events means that the exhibition attracts large numbers of visitors, whilst ensuring that exhibitors receive a targeted audience. Team – Max Interior Design (P) Ltd.
Project : Shriram Auto Mall (I) Ltd. Branch Office for Shriram Auto Mall India Ltd. at Rajkot – Gujrat – India. Client : Shriram Auto Mall India Ltd. Branch Office for Shriram Auto Mall India Ltd. at Ahmedabad – Gujrat – India. Branch Office for Shriram Transport Finance Co. Ltd. at Bhatinda – Punjab – India. Our Ongoing Project – Prism Infracon Ltd.
Corporate Office for Prism Infracon Ltd. at Rajarhat – Kolkata – India. Client : Prism Infracon Ltd. It gives me great pleasure to share with you today, the anniversary of our company – (MIDPL) Max Interior Design (P) Limited. To achieve our vision of being the most preferred Interior Design Company in India and United Arab Emirates, we are committed to provide the best and most personalized services in the industry. Our success is attributed to the relationship we share with our clients. Branch Office for Shriram Transport Finance Co. Ltd. at Sahibabad – Uttar Pradesh – India. Branch Office for Shriram Transport Finance Co. Ltd. at Bareilly – Uttar Pradesh – India. Branch Office for Shriram Auto Mall India Ltd. at Lucknow – Uttar Pradesh – India. Branch Office for Shriram Auto Mall India Ltd. at Kanpur – Uttar Pradesh – India. Branch Office for Shriram Auto Mall India Ltd. at Agra – Uttar Pradesh – India. Completed Projects – STFC Ltd. Branch Office for Shriram Transport Finance Co. Ltd. at Janak Puri – New Delhi – India. Branch Office for Shriram Transport Finance Co. Ltd. at Saharanpur – Uttar Pradesh – India. Branch Office for HSBC InvestDirect Securities (I) Ltd. at Green Park Extension – New Delhi – India. Client : HSBC InvestDirect Securities (I) Ltd. Branch Office Renovation for HSBC InvestDirect Securities (I) Ltd. at Jaipur, Jodhpur, Kanpur, Chandigarh, Amritsar, Jalandhar and Ludhiana – India. Branch Office for Ravi Commodities (P) Ltd. at Camac Street – Kolkata – India. Cilent : Ravi Commodities (P) Ltd.
Hibiscus Residential Complex at Gurgaon – Haryana – India. Cilent : Mfar Constructions (P) Ltd.
Max Interior Design is one of the few companies in India that offers a truly Turnkey Solutions for companies considering relocating or refurbishing their premises. We have been delivering quality Turnkey Interiors for Corporate, Retailers and Hospitality users since the beginning of 2006. Planning, Designing and Building every aspect of the interior from start to finish. 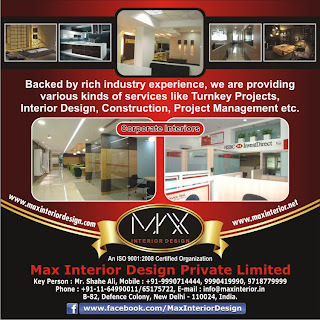 Max Interior Design everlasting strives for Excellency in every project has bought in a growing pool of clientele from Residential to Commercial, Interior Designs, Banks, VIP Lounges as well as Turnkey Projects and Exhibitions. Long term relationship with our clients is extremely important to us as it proves that our clients is satisfied and trust that we can deliver a good job on time every time. We have the experience and the expertise to provide a professional service through every phase of the process. Strategic Facilities Planning, Interior Design, Procurement and Project Implementation, if you are looking to re-plan or relocate to accommodate your changing business, you should be talking to Max Interior Design. The Team Max Interior Design consists of highly qualified and experienced Professional in various fields. This experience and wisdom comes in handy while handling projects of any nature or scale, right from designing to planning, procurement, finance, time management, execution etc. The overall management of contractors and suppliers making sure those milestones are reached and the quality, time and budget requirements are adhered to . . . .
To achieve our vision of being the most preferred Interior Design Company. We are committed to provide the best and most personalized services in the industry. Our success is attributed to the relationship we share with our customers. Branch Office for Shriram Transport Finance Co. Ltd. at Janak Puri – New Delhi – India. Client : Shriram Transport Finance Co. Ltd. Branch Office for Shriram Transport Finance Co. Ltd. at Saharanpur – Uttar Pradesh – India. Client : Shriram Transport Finance Co. Ltd. Branch Office for HSBC InvestDirect Securities (India) Ltd. at Green Park Extension – New Delhi – India. Client : HSBC InvestDirect Securities (India) Ltd. Branch Office Renovation for HSBC InvestDirect Securities (India) Ltd. at Jaipur, Jodhpur, Kanpur, Chandigarh, Amritsar, Jalandhar and Ludhiana – India. Client : HSBC InvestDirect Securities (India) Ltd. Branch Office for Ravi Commodities (P) Ltd. at Camac Street – Kolkata – India. Cilent : Ravi Commodities Pvt. Ltd.
Hibiscus Residential Complex at Gurgaon – Haryana – India. Cilent : Mfar Constructions Pvt. Ltd.